Miami 2017: Florida Fever, Tournament Intrigue, and Roger! Why does Roger's relationship with Peter Carter's family make me want to go to Miami? And how much I love Roger. Roger is back in Miami after missing the tournament the last two years. Is it the last time to see him in person there? Or see him anywhere - because we don't know about the future - we could be at war by 2018 if the Big Baby gets angry enough. But assuming civilization survives it could still be the last time to see the tournament in Miami. The story of the creation and evolution of this event and the politics involved are truly bizarre. But Roger first. After watching him for so many years at Indian Wells and being a true fan, idolizing his game and admiring him as a person, well it might sound weird, but the chance to just observe him in a different environment is something I look forward to. Different practice courts, different walking paths around the grounds, different stadiums, different interview rooms with different media - seeing him react to the very different Miami demographic. Yes, stalking basically. OK, Roger's more than a tennis player to me (and a zillion other people). He is a force for humility, humanity, and decency in the Kafka like new world. Here is one Roger example that bolsters the reputation of our species. Maybe you already saw the story about Roger and Peter Carter's parents during the Australian this year? Bruce Matheson: can one man kill the Miami Open? He'd like to. It's not something Roger seems to talk about much but it moved Johann Kriek enough that he posted about it on Facebook - isn't that where the only good news is these days? Peter Carter, a former Australian player, then in his mid-twenties, became Roger's first coach when Roger was 9. 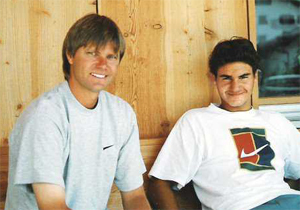 Peter stayed with him for over a decade as Roger became the number one junior in the world and then transitioned into pro tennis. Then Peter died in a car accident on safari in South Africa - a trip that Roger had suggested. This was the year before Roger won his first Slam at Wimbledon in 2003. Roger was playing in Canada at the time it happened. According to a source at his hotel, he ran screaming through the streets of Toronto. And now every year at the Australian Open, Peter Carter's parents, Bob and Diana, travel from Adelaide to watch Roger play. Roger's team sends them first-class air tickets, books a room in the same hotel where Roger stays, takes care of their tickets, their food and makes sure they are invited to the parties. The Carters see their son Peter in Roger, and support him as if he was their own son. So yeah I am going to Miami this year. Now let's move from the tragic to the surreal. Ever hear of a guy named Bruce Matheson? As you may know the Miami Open is played in a public park, Crandon Park, on the island of Key Biscayne, and the only way in is by yacht - or for the rest of us a narrow causeway that can't come remotely close to handling the traffic. That's where Bruce comes in. He has a yacht down there. But Bruce has something else: a deep seated hatred for the event and an apparently ironclad family legal position he has used to (mostly) block everything the tournament owners want to do. Given the politics it's amazing the Crandon Park tennis facility was even built. Bruce's wealthy grandfather W.J. 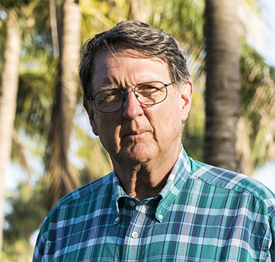 Matheson bought up most of Key Biscayne when it was an undeveloped island. In the 1930's the family donated part of the land to Dade county and in return the county built a bridge to Key Biscayne. But a restriction in that deal is plaguing the event. The land the county got would be used "for public park purposes only." Private companies - like, say, the one that now operates the Miami Open - would be banned. 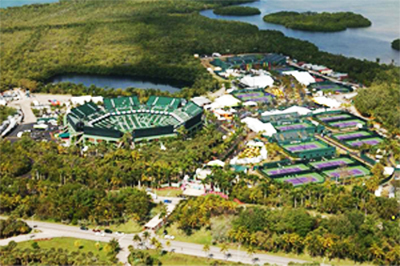 But somehow the tournament founder Butch Buchholz and Dade county still managed to get the tournament started by building a public tennis center on the site of what had been an old dump on part of that land. From everything I have read it's not clear how they got that past Bruce in the first place. Maybe he was out on his yacht. Butch has claimed publicly he had never even heard of the restriction til later. So when the tournament tried for its first upgrade and building a major stadium in the mid 1980s, well that's when Bruce decided to try to drive the event out of Florida for good. "You don't turn a privately dedicated public park into a commercial development zone," Bruce said at the time. Well, that statement was a little late as the tournament was well established and a huge international destination for tens of thousands of paying fans. Serena; Miami Open winner and advocate. But Matheson and his supporters still sued, claiming the tournament's use of Crandon had violated the original Matheson deeds and should never had been allowed in the first place. Eventually there was a mediated settlement. Only 7,500 of the new stadium's seats would be permanent, and bleachers and temporary tents would be set up each year for everything else. And there was a final provision - one that is likely fatal to the future of the tournament. These improvements were a one-time exception. The settlement prohibited the tournament from building any future permanent structures on the grounds. That's why there are porta pottys everywhere. Fast forward to the current situation and you understand why IMG, the management company that bought the event from Butch, can't spend $50 million dollars to upgrade the facility the way they want to. In a referendum , 73 percent of voters backed that upgrade. But when Matheson sued, the tournament lost. Lawyers for the tournament characterized Matheson as a wealthy, uneducated misanthrope. Bruce countered, non-sense, he enjoyed playing tennis in his youth. Tournament supporters point out the tournament has generated over $380 million dollars for Miami-Dade county and that other communities would pay tens or hundreds of millions to buy it. That is obviously what Bruce wants to happen. But most people in tennis want it to stay. Serena Williams wrote an op-ed piece in the New York Times saying that - a feeling shared by most of the players. Not to mention the fans. As I wrote last year, compared to Indian Wells the difference in the demographic is shocking. Although IW has become much younger, hipper and a prestige destination, a lot of the attendees there are still the same old white people that booed Serena and Venus. Miami is thoroughly international with families and kids running everywhere - even if the facilities now resemble a county fairgrounds in decline. Upgraded like IW, this tournament would be stupendous. I want to see the same backhand Roger hit in the Australian final. But, at least for this year, it's the same rickety bleachers, the worn tents, and some standing, smelly water here and there. The lease has 6 more years to run under the current restrictions - but who knows what might fall down on the grounds in that period. And the future? Well people are saying all kinds of evasive words. Someone probably knows something. The rest of us will find out someday. Meanwhile how about that Roger? 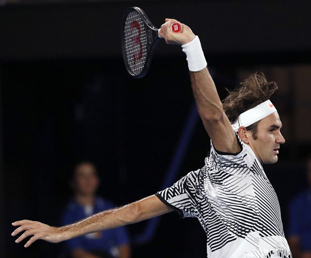 Did you notice the difference in his backhand in the Australian final? Almost no slicing. Drove every backhand very explosively! What was different? First as Jim Courier showed on air last year the 95 square inch racket head allows Roger to play closer in and increase velocity on his backhand drives. But did you notice where he was hitting those drives to Nadal? Right, about halfway out from the centerline to the sideline. Not trying to create angles. Not hitting down the line. Why? The story I heard from a reliable source is Roger had some intel that this was the area in the court where Rafa statistically hit the fewest forehand winners. Fascinating if true and maybe I will get to watch him do the same in Miami. See you there?